What ever happened to last year's Best of CES winners? 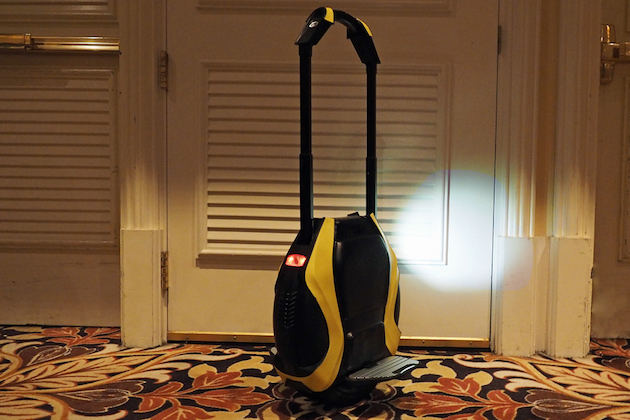 Tired of walking, but can't quite cough up the scratch for a Segway? Say hi to the Inmotion R2 in the gallery below. It's a two-wheeled, personal electric vehicle that glides along at a leisurely 9MPH for around 18 miles. It's self-balancing -- you lean slightly forward or backward to move in each direction. Harder leans mean faster speed; tilt the removable handle left or right and you'll start doing donuts -- something Honda's similar contraption does hands-free. Even for this writer, who's never gotten on one of the contraptions before (nor anything even remotely similar), it took about four or five minutes to get the hang of it. After that? No real problems. If you get tired of riding, or perhaps there are too many people around to weave around, you can pull it behind you with the motor assisting -- you won't be dragging dead weight. Perhaps the most interesting aspect, though, is what it can do when connected to your smartphone via a companion app. You can create a geofence that the contraption won't go beyond (probably perfect for keeping kids safe), adjust the tilt sensitivity, set the max speed and a few other things. Where things get crazy is with the follow mode. By carrying a small dongle in your pocket, the R2 will follow behind you and avoid obstacles along the way. How's it work? Through the magic of sonar, of course. The foreign models will get this update via a software download, but we're told that domestic models will have it baked in from the get-go come release this March. See Honda? These types of things actually can come to market. The R2 also has a smaller cousin, the V3 (pictured above), which looks like a colorful cymbal case. It's deceptively two-wheeled, but unlike the R2 it can't self-balance. The lil' fella is more akin to a bicycle and balances front to back as opposed to left and right. Meaning, you can't stay on the unit and stand still. I watched someone try it repeatedly and, well, I got a first-hand example of Albert Einstein's purported definition of "insanity." It's also sporting a lamp on the front and back that makes it omnidirectional. Give the unit a sharp jab and the light-giver will automatically change from front to rear without missing a beat. See Honda? These types of things actually can come to market. And if you hate the sound of the streets around you, it even will do music streaming via a Bluetooth connection from your smartphone. And now for the pricing: Each one is in fact cheaper than a Segway, but they're still relatively expensive. Come March, the R2 will set you back $2,499 and the V3 is a slightly more manageable $799.